I don't understand. Why would anyone patent peer review on a computer or otherwise? Isn't it kind of up to the, I don't know, peers doing the reviewing? Oh.. nevermind. It must be to protect the furtherance of the progress of the sciences and the arts. I get it. From this angle Elsevier looks like it's aim is to crush innovation vs innovate, and with a patent, no less. Ironic. Elsevier is the epitome of preventing the flow of academic information. "I was published in another academic journal! Woohoo!! No, no monies." ... Uhhh, that still means that much to you guys when, you know, a huge chunk of the population is a few key taps away? I guess it's pretty cool to be smart, huh? And have all your hard work and research paid for and seen by millions.. well, except for that last part. That type of "progress" needs a vaccination. Yes, but doing it on a computer changes it from 'meh' to 'amazingly innovative', and absolutely deserving of a patent! I mean come on, who could have ever conceived of something done without a computer, instead being done with a computer to speed up the process? The kind of brilliance required to make that leap absolutely deserves a patent. So Elsevier really do believe that they should own and control the worlds knowledge and are taking steos to gain that control. The National Science Foundation has been doing remote peer review of proposals for many years now. Their FastLane system is the server based tool that they use to do this. Seems like it may be prior art? "We hope that Elsevier will not be aggressive in its own interpretation of the patent's scope." Any statement that begins, "We hope that Elsevier will not," should properly be ended, "survive as a business." - option b: "but we suppose they will." So, elsevier wants to ban anyone else from using a computer anywhere in the peer-review process. Classic protectionist behaviour. On the plus side, they are obviously afraid of something. That indicates the alternatives are becoming valid. "Stupid Patent" isn't that redundant? One also wonders how much of a role Elsevier played in the forthcoming EU proposed directive overhauling copyright law to include 'publishers' among those eligible to exercise related/neighboring rights under EU copyright law (as well as extending these rights from 50 to 70 years). Much attention has been paid to new rights to newspapers, but at best Elsevier stands to gain, even if it was among the lobbyists (which is doubtful). "Elsevier's business model has been compared to a restaurant where the customers bring the ingredients..."
"...do all the cooking, and then get hit with a $10,000 bill from the "restaurant". Otherwise, the analogy gives Elsevier credit for the restaurant facility, but the peer review process is done by other Profs located at other universities. Elsevier is just a market...that charges like it were the supplier. - It's like if a real estate agent sold your house, then kept all the money. - It's like if Uber arranged for drivers with cars to do business with passengers, but after a driver gave one ride, Uber owns her car and she's not allowed to use it anymore. - It's like if the NASDAQ hosted your trades and equity sells, but then owns your stock, and gives you a cut of the dividends. - It's like if the RIAA companies produced your record, but then had you by the nutsack, owned your music, and extracted every penny they could from it, while giving the artist a pittance or nothing at all...hey wait, it IS like that. 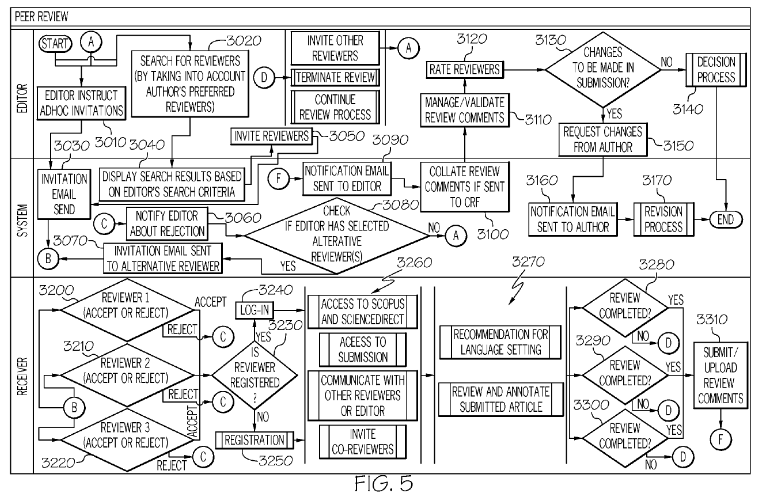 ROFLMAO, Another business process "On The Internet" patent. I was working for a very small software company who got something like 40% of their business from Elsevier (this turned out to be a bad idea). They discovered Elsevier had copied or maybe reverse engineered the software and set up their own system to avoid paying for the service.